Do you live in Noe Valley, or next to it (check our handy map, as no neighborhood is, er, an island) or go to it? Then please go sign the petition showing your support for a TRIAL of a plaza at Noe and 24th. Thanks to the Noe Valley Association and Pavement to Parks program, Noe Valley has been awarded funding to create an amazing plaza and public space on Noe Street (just south of 24th Street) on a TRIAL BASIS. This would be a community space where neighbors can gather and socialize, where kids can play, where members of the community can sit, drink, eat, or rest while strolling and shopping in the area. What will the Noe Valley Plaza look like? During the trial, removable furniture and planter boxes will allow residents to enjoy the space without breaking concrete. If the plaza becomes permanent, we can make the Noe Valley Plaza into anything we want. Yes, trees could be lush and 15 feet tall, bushes sprouting blossoms and an arbor twined with jasmine. To date, the Noe Valley Association has planted over 137 trees in the 24th street corridor, placed numerous flower baskets, installed benches and planters, and engaged a horticulturist for their upkeep. 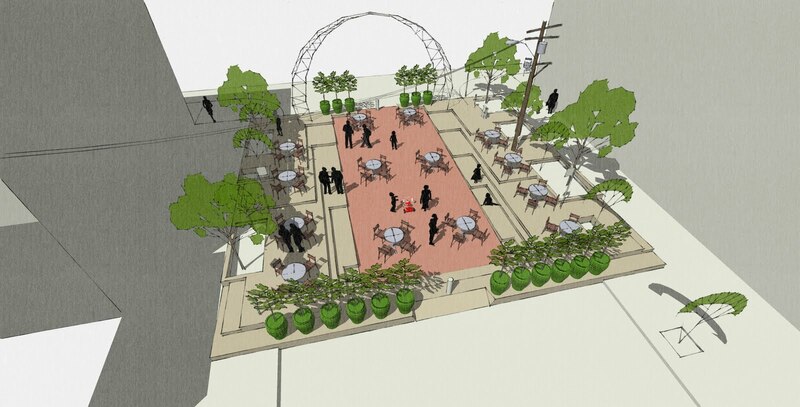 Renowned landscape design and architecture firms, Flora Grubb and Boor Bridges have agreed to donate their services to the Plaza from the very outset. This is an amazing opportunity, indeed! More information is at http://yesnoevalley.blogspot.com and don’t forget to email your support to Gavin, Bevan and friends. ← Look Upon My (Geotagged) Works, Ye Mighty, and Despair! Having had a pretty idyllic childhood in Noe Valley, I can’t imagine how this wouldn’t be fun for kids now! Those who say they need to drive along that street (although I’m not sure why; there are stop signs every block) forget the elaborate ballet of messed-up right-of-way that makes that intersection annoying anyway. More ped space: awesome. Especially for a TRIAL.